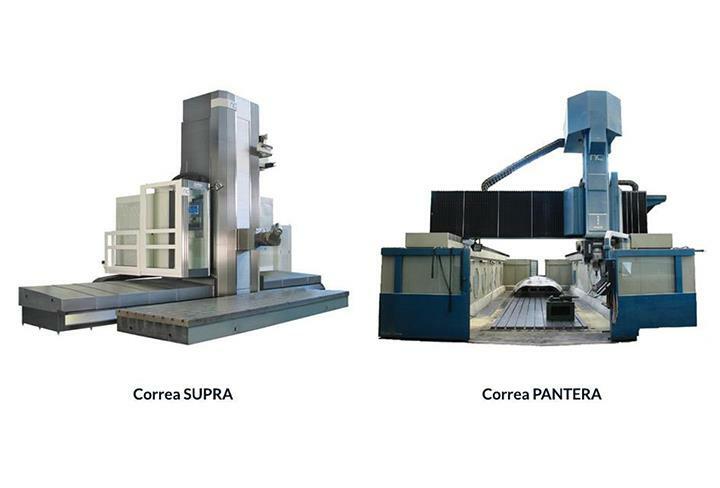 Three second-hand Correa SUPRA and Correa PANTERA milling machines have been purchased by Nicolás Correa Service. These milling machines are large-format and high-performance. NC SERVICE has purchased two travelling column milling machines, one being the Correa SUPRA 90 model and the other the Correa SUPRA 120. Both these large-format milling machines offer excellent versatility and high dynamics, ideal for sectors such as wind power and aeronautics. Both milling machines were made in 2008 and are fitted with a Heidenhain TNC-530 numerical control and their features include an Universal Auto-indexing Differential Head (0’1º ), chip removal, automatic tool changer, coolant through the spindle (30 bar) and automatic head changer. The Correa Supra90 milling machine has a 9,000 mm travel on its X axis whilst the Correa Supra120 has a travel of up to 12,000 mm on its longitudinal axis. This latter machine is equipped with a 60 T divider plate. Furthermore, Nicolás Correa Service has also purchased a second-hand high-speed Gantry type milling machine, the Correa Pantera model. Thanks to its bridge type structure, its large dimensions, reaching 14,000 mm on the X axis, in addition to its 5-axis electro-spindle head which operates at 18,000 RPM, this milling machine is the perfect solution for long-travel machining applications. Based on the concept of reliability, rigidity and versatility, this machine is particularly suitable for the aeronautics sector, thanks to its considerable dynamism, flexibility and precision. These three machines are available at NC SERVICE, included in the company´s current second-hand milling machine stock.